T-minus five days until Christmas! Just in time for “five gooooolll-den riiiiings”. 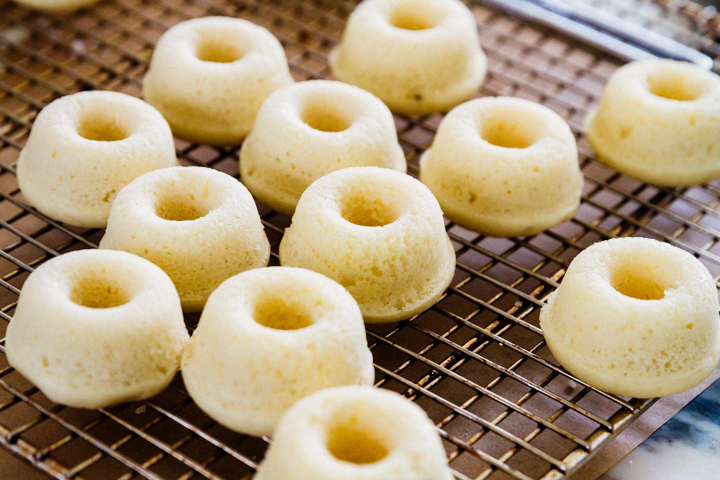 What a better way to give ode to five golden rings than a recipe of Snowman Donuts & Eggnog? 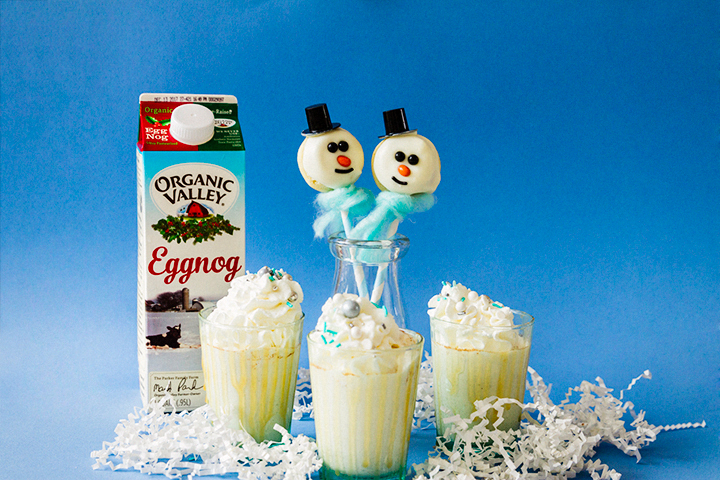 These cute ‘snow-bros’ are as yummy as they are cute, and you can wash them down with a caramel and cinnamon-flavored organic eggnog topped with whipped cream. 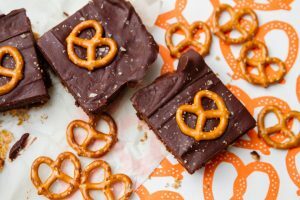 Just in time for the holiday sugar rush! Butter 14 holes of three donut tins. Mix the batter according to the recipe, and spoon the batter into buttered donut wells, filling them about 1/4-inch from the rim. Bake in preheated oven 7 – 8 minutes, or until toothpick inserted into donut comes out clean. I used sprinkles for the face, and found the top hats on Amazon. Be careful to buy the right size! I initially bought ginormous ones, but the ones you want are 28 x 17mm. 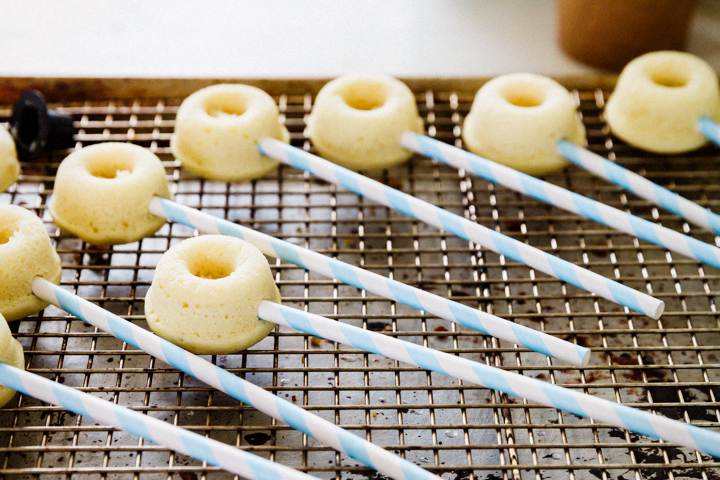 After the donuts have cooled, push a straw into the bottom of each donut. I found these cute blues ones at Shop Sweet Lulu. 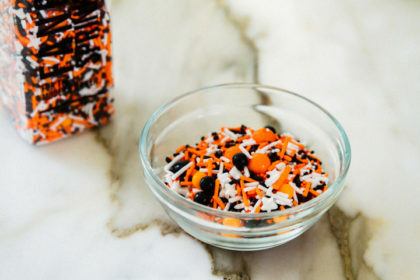 For these guy’s faces, I plucked black sprinkles from my Halloween stash of Fancy Sprinkles. 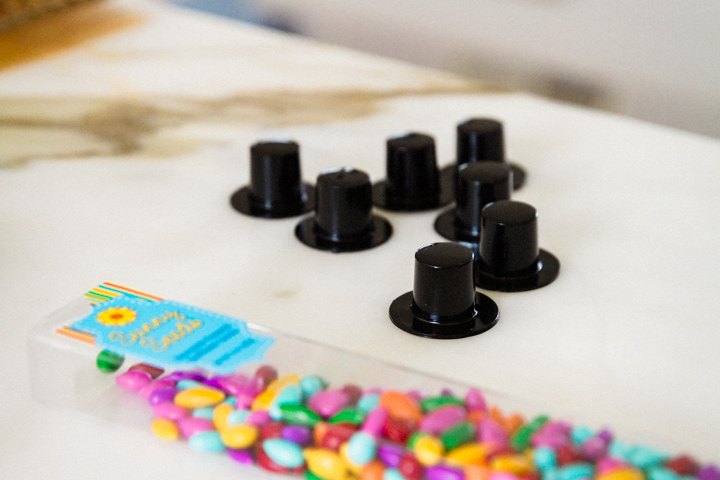 The nose, however, you can find at either Joann’s or Amazon – they’re actually chocolate covered sunflower seeds! And again, the top hat is from Amazon. Mix up the glaze. If desired, tint with food coloring. Warm in microwave in 6 – 10 second intervals on HIGH power to warm since the glaze begins to set while dipping donuts. 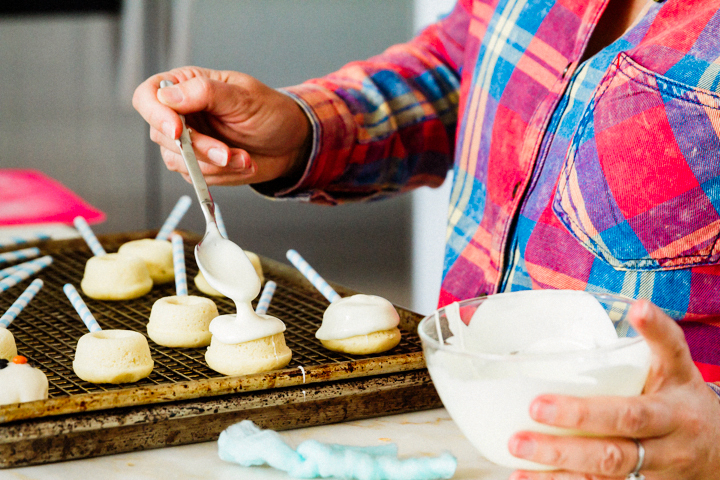 I had to whisk after heating before I continued spooning the glaze on the face of the donuts. Timing is important. Put the face on when glaze is wet so everything sticks. Wait to adhere the hat a little later, after the glaze solidifies. Then, use warmed glaze as glue and stick on the hat. 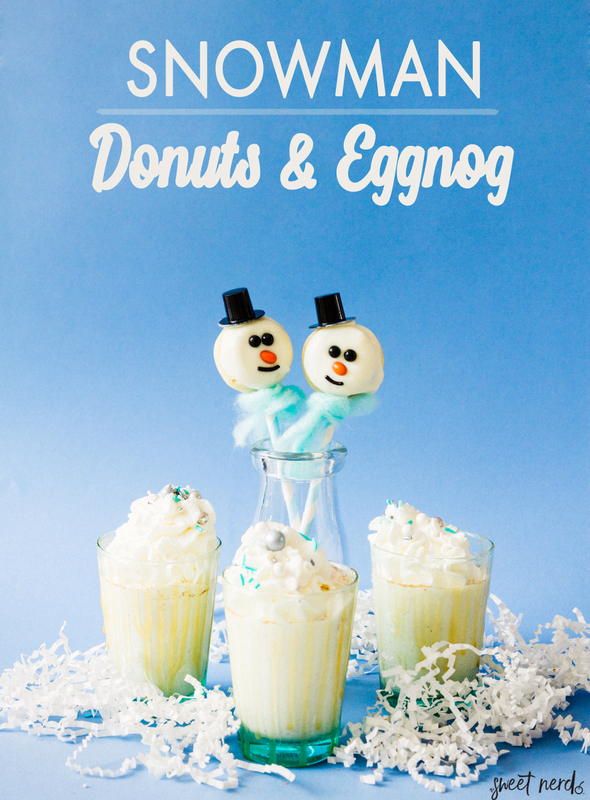 SNOWMAN DONUTS & EGGNOG – COZY! 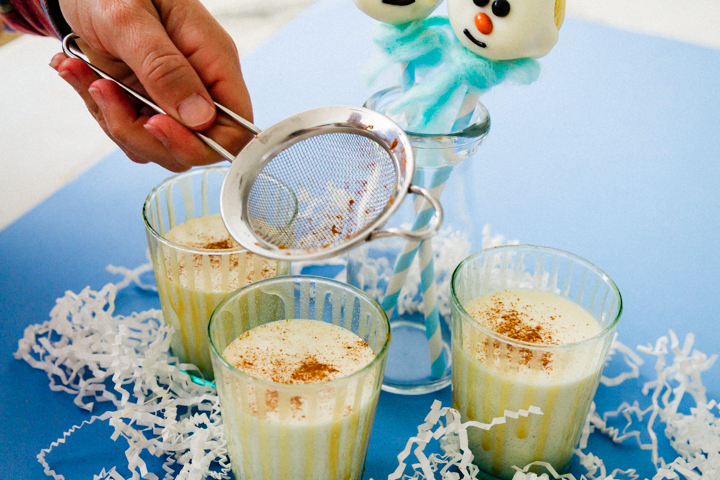 You can’t just have regular ol’ eggnog this season. There’s so much more fun to be had. Make it clean with Organic Valley Eggnog, and glam it up with Reddi Wip, Torani caramel sauce, and a sprinkle of cinnamon to make it fancy. Speaking of fancy, top it off with some Fancy Sprinkles – I used blue and silver balls. 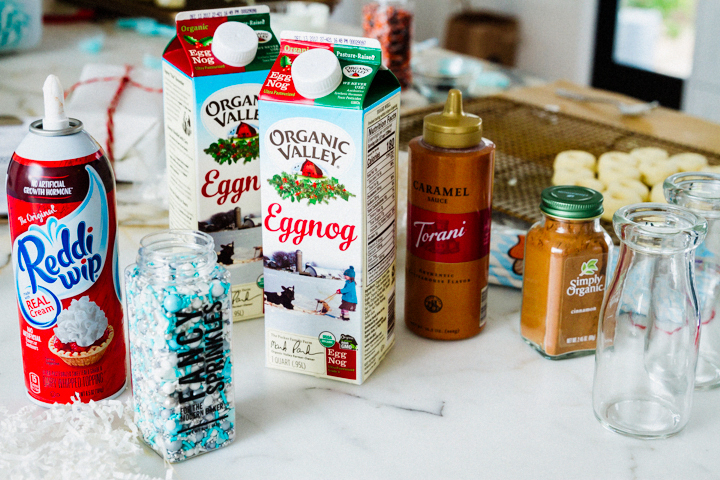 Before you add the Reddi Wip, sprinkle cinnamon directly onto the eggnog. I used Simply Organic, my go-to. It’s my favorite spice brand, so pure and high-quality. Plus, I had fun meeting representatives from Simply Organic at the Hedley and Bennett conference I attended earlier this year. Keep these little dudes warm by taking a piece of yarn and pulling it loose around their straw necks. 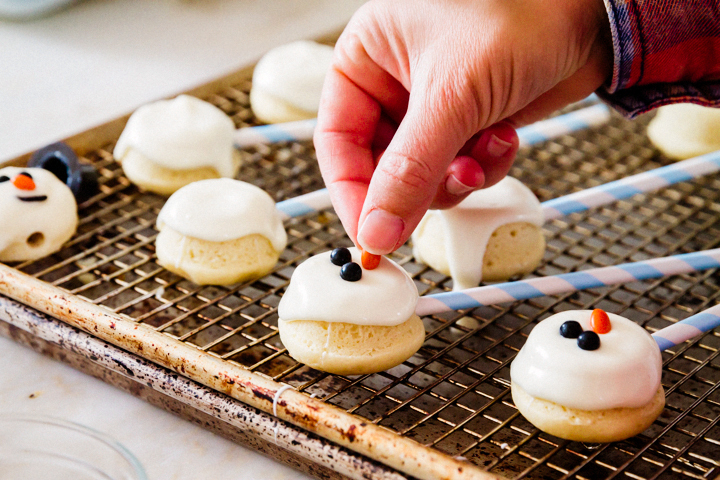 These Snowman Donuts & Eggnog will bring a little winter cheer to any table. Even here in warm, sunny Los Angeles! 1Preheat oven to 425 degrees. Butter 14 holes of three doughnut tins and set aside. In a mixing bowl, whisk together flour, baking powder, baking soda and salt for 30 seconds, set aside. In a separate mixing bowl, using an electric hand mixer, blend together melted butter, vegetable oil, sugar and vanilla bean seeds until smooth, about 1 minute. 2Blend in eggs one at a time then mix in vanilla extract. Working in three separate batches, beginning and ending with flour mixture, add 1/3 of the flour mixture alternating with half of the milk and mix just until combined after each addition. 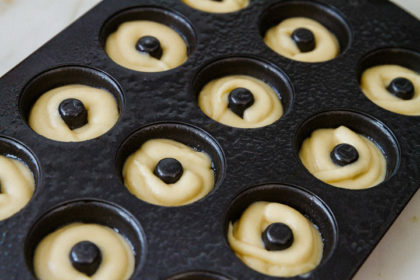 3Spoon batter into buttered doughnut wells, filling them about 1/4-inch from the rim. 4Bake in preheated oven 7 - 8 minutes, or until toothpick inserted into doughnut comes out clean. 5Transfer to a wire rack to cool until lukewarm then dip in glaze and return to wire rack. 1In a flat bottomed bowl, whisk together powdered sugar, melted butter, vanilla and salt then stir in 2 Tbsp of milk, adding additional milk 1 tsp at a time to reach desired consistency and whisk until smooth. 2Tint with food coloring if desired. Warm in microwave in 6 - 10 second intervals on HIGH power to warm as it begins to set while dipping doughnuts, as needed, whisking after heating. 1Push straw into bottom of donut. 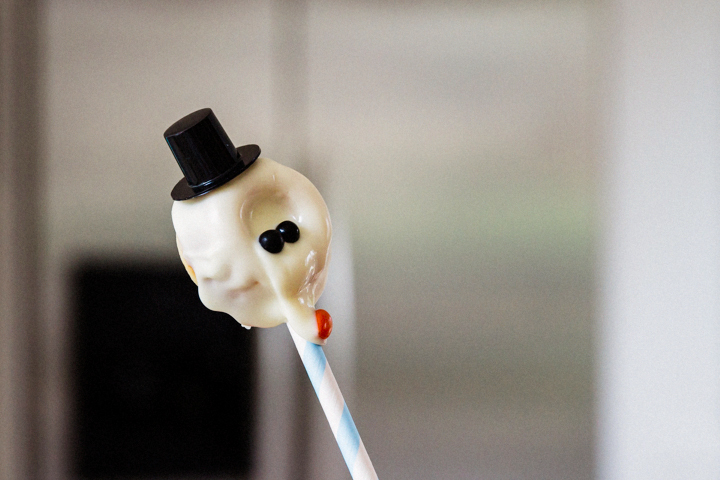 2Using melted white chocolate, attach nose, eyes and mouth for snowman face. Then using melted white chocolate, attach the top hat on top of the donut. 3Tear apart some blue yarn and attach to straw for scarf. I’m here in sunny LA and I’m wanting snow and coziness this weekend. These guys will help with that. Plus they look so yums! I know, snow would be perfect but it aint gonna happen. Hope you have a cozy holiday anyway! I’m dying for snow right now!! I love to ski and the snow that’s at wrightwood is already so melted and muddy. Luckily this guy is cute enough to keep my spirits up. There’s still hope, Kendall. Maybe in January they’ll get some snow. 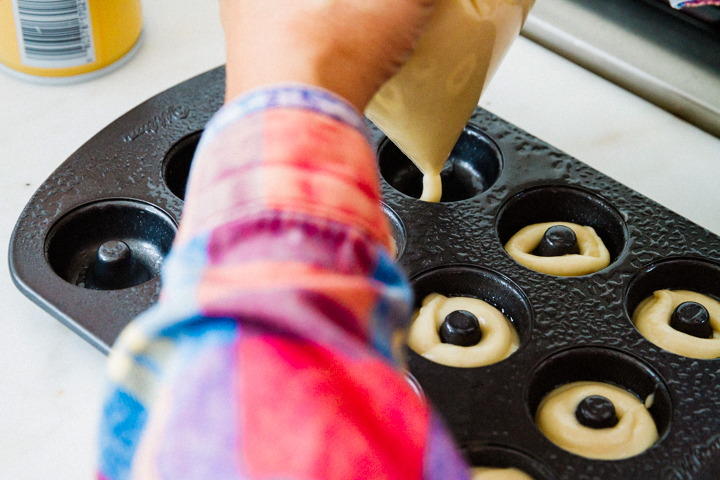 In the meantime…whip up these donuts. These look adorable! 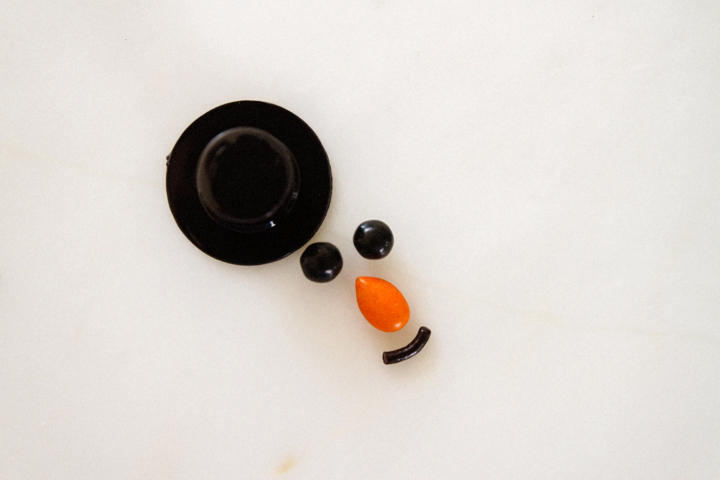 And that sad little melting snowman/baking fail made me laugh – definitely had those moments. 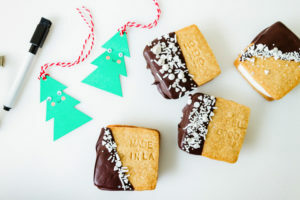 Hoping for a white Christmas here on the East Coast and these look like the perfect cozy treat. Ah, I’m jealous! Have a cozy holiday, Tara. 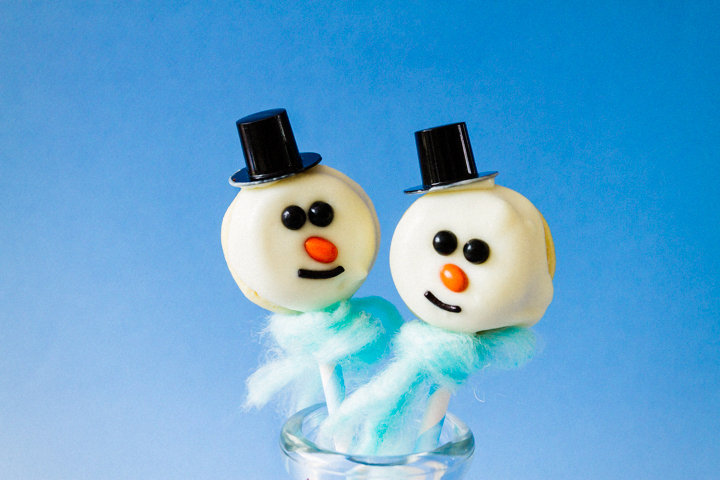 These have got to be the cutest little snow men I have seen. Looks yum too. Thanks Chichi, they are super yum. 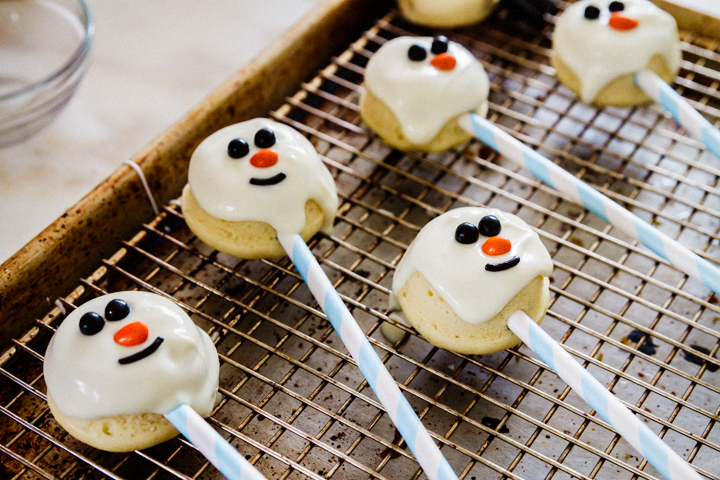 The snowmen are really adorable! What a creative recipe! 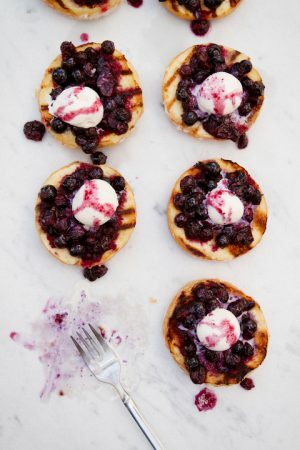 Great idea to serve them with eggnog! 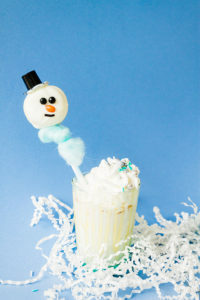 The eggnog really makes this recipe special. It’s easy and delish. Thanks Sues, it was a fun project to put together. 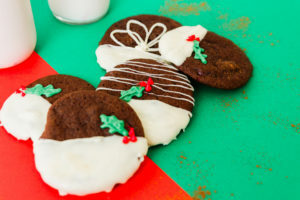 So stinking cute – I love these donuts and eggnog! Just the cutest! A perfect holiday treat 🙂 Happy holidays! Happy holidays to you too Jennifer!